How did the Exmoor Challenge Go? District 1200 won the trophy again! SENIOR CHALLENGE – Wimbleball Sunday 1oth April 2016. Well weren’t we blessed; with the weather, with the turn out and with the funds raised? It was a great day all round. The majority of the money will be going to The South West Children’s Hospice, with donations also going to Exmoor Search and Rescue, The Wimbleball Lake Trust and Devon Air Ambulance, at the request of The Bampton First Responders. In all 133 walkers; Rotarians, their family members, children, friends and a number of dogs and local people all willing to take part. After egg, bacon and sausage rolls, prepared by three former Presidents, two member’s wives and a former member, the walkers started out around 0900 on one of the two walks. They had come from various places; Bude, Lyme Regis, Mendip, Yeovil, Bridgewater, Warminster and other rotary clubs. The last group leaving at 11 o clock with two young children and dogs. Assisting with the event were 19 Exmoor Rotary members, 5 partners, 4 friends with assistance from Exmoor Search and Rescue and Bampton First Responders. An early hiccup was identified; we had had to change the route due to restrictions placed late on us. This meant that the outward part had changed and the shorter walk was basically reversed. New written route cards and maps were available, but unfortunately not all walkers were made aware of this and issued with the revised route. It therefore became rather confusing with them following the old route they had printed off from the web site. My sincere apologies for this. This also meant rather more than the specified distance was covered. It won’t happen next year. Although it remained sunny and dry the wind also caused some walkers a problem with some of the route sign Having taken into consideration comments made about the difficulty of the terrain on previous walks, neither of these routes were too challenging with regard to climbs, the rain had made it rather spongey in places. By 3.30pm, even with the ‘challenges’, all had returned safely, having enjoyed the views and countryside. The quickest around the long course (10 miles approx) took just over 3 hours. After they had checked in everyone was able to refresh, relax, reminisce and comment, with plenty of homemade cake and tea available. A big thank you for the donations you all made at this time. District 1200 (Somerset, parts of West Wiltshire and West Dorset) swept the board and again walked off with the trophy. They outnumbered District 1175 (Devon, Cornwall and the Isles of Scilly) by almost 3 to 1, which is a bit disappointing. However, 1175 did have a workshop running on this day, not quite sure how the dates managed to clash, but this may have accounted for the low numbers from 1175. 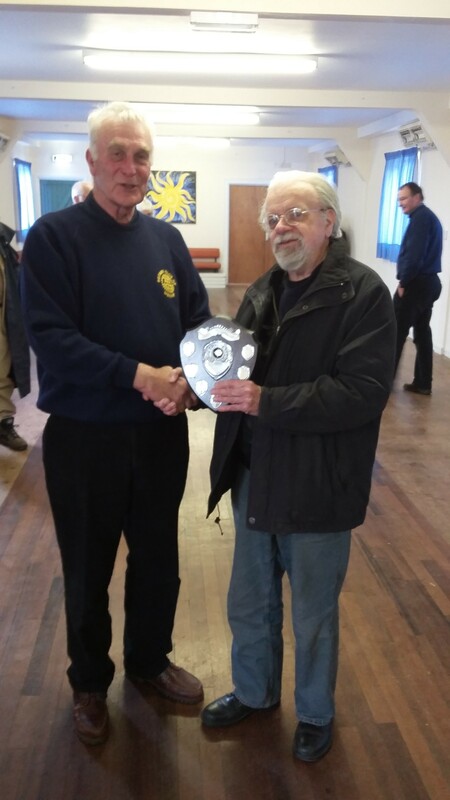 On hand, at the end, was 1200 District Governor Bob Acland to reclaim the trophy, which was presented by Exmoor’s current President David Whiteway. Thank you all for supporting us, whether walking or assisting or cake making. Look forward to seeing you all and your friends next year. The Rotary Club of Exmoor.